TOKYO--(BUSINESS WIRE)--Toshiba Tec Corporation (TOKYO: 6588) announces that its e-STUDIO4508A has earned Keypoint Intelligence - Buyers Lab's Summer 2017 Pick. Toshiba's latest monochrome product surpassed comparable multifunction peripherals (MFPs) in reliability, usability, security, value and features during six months of rigorous, side-by-side product testing. “Recently Toshiba’s e-STUDIO5005AC, e-STUDIO6506AC, and e-STUDIO4508A have received Keypoint Intelligence-Buyers Lab’s ‘Highly Recommended’ and ‘Highly Reliable’. 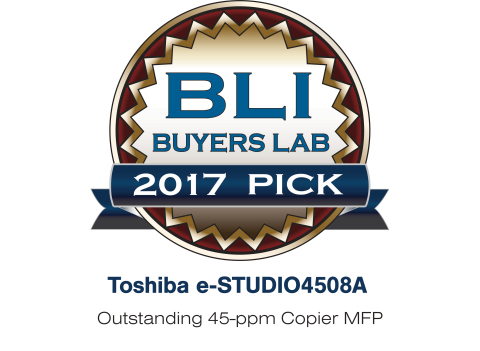 This time, the e-STUDIO4508A has also won the Pick award 2017 summer, and we are very proud that Toshiba’s MFPs are recognized as the valuable products to contribute to our customers, for example, achieving better communication and smarter workflow,” said Sachio Koyama, General Manager of Products, Marketing & Service Division, Toshiba Tec Corporation.